There's something about walking in a light rain through a familiar city that makes me feel grounded and peaceful. I attribute this to the (soothing, cool, soft, fluffy) fog in my hometown of San Francisco, my native habitat. This has made drizzly walks feel soothingly familiar this week here, in Basel, Switzerland, a town I'm getting to know well after working here about five cumulative weeks. It's a lovely town. A town with individual houses older than my country. And there was also the fear of pulling a muscle while rolling my eyes reading those first messages from stateside friends, messages implying that I was having the time of my life, and that working 14 hour days in Europe is somehow like a spa vacation, as I dragged myself back to a hotel to faint for the evening. If I am in a place, I really want to KNOW the place. I want to have habits, routines, and new things to do beyond those routines once I have established them. I STUDY. I take photographic notes. I map out relationships in my head. It's not memorization like studying for a test: it's like making the sketch of a scene in preparation for a large painting or drawing. You experience a place, get to know its details and textures, see it in different lighting conditions and weather, and then you have a deeper experience of being there. I want to have a relationship with a place that appeals to me. A pleasant relationship. My friend M once had a good laugh during a trip we took to New York City together. She was not laughing because (with my happy face) tourists stopped me to ask for instructions on how to buy metro tickets and for directions on which subway trains to take. She was laughing because I actually showed them how to buy tickets, and which machines to buy them from, plus I actually gave good subway line directions, even though I am also a tourist. Because I have a relationship with New York City. The parts of it that I know, I know well. It all feels familiar. Familiar enough that I can pay attention to the things I want to pay attention to, without making much effort in getting around. I have habits there, favorite places, memories of the different seasons, of sloshing through snow, of dining outside in Bryant Park on warm days with a dear friend, of sitting there on warm evenings. It feels so luxurious to have habits like that… They are rich, warm, velvety experiences. The early days here were strange: the long ride from Zurich, with rolling hills with trees in the inverse of where trees would be in California. Cornfields. Thunderclouds off in the distance. Siri replying in German to the shuttle van driver's request that she call his colleague (she offered to look him up on the web instead). 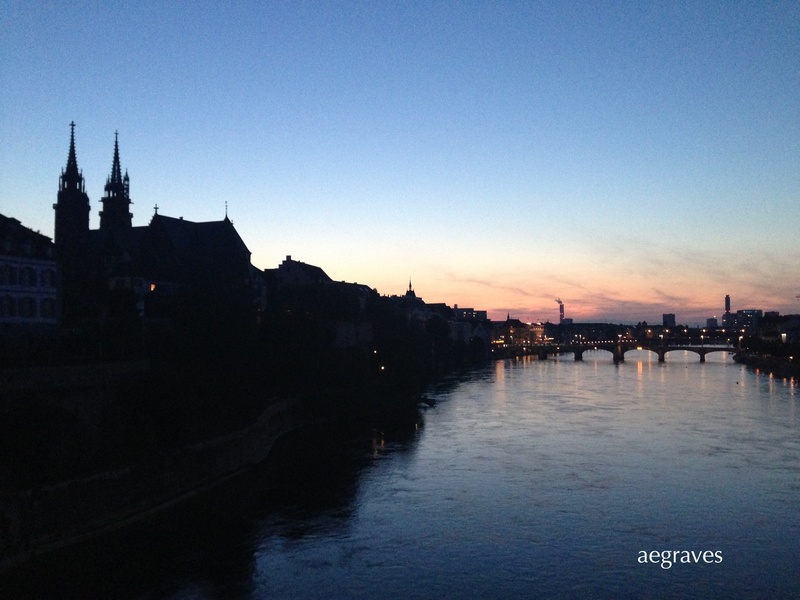 A dense neighborhood abruptly interrupted by the broad, flowing, open expanse of the Rhein as we crossed a bridge… I had just that one night to recover from my travels, and then the meeting marathons in rooms full of strangers began! It's hard to improve on that as a way to be introduced to a place after a long wait. It is more difficult to be away from my home, my bed, my loved ones, harder than I had hoped. When I tried to write about this in my journal, I wound up on a tangent that had me listing all of the things that, even during that first visit, I really LIKED about Basel. Sincerely liked. The skyline. The hills. The half-houses in the old towns, with their half-rooflines. The calligraphy around the doors of the older homes, many of which have names in addition to numbers. The fountains, all gushing potable water, all day and all night. The narrow little streets, which are restricted for car use, but are unrestricted for velos and motos (bikes and motorized two wheelers). The elaborate ironwork over some older windows. The way the bells ring, on and on, at various hours of the day. It isn't about telling you the time, though it starts that way; it's about really working those bells, first to get your attention, then to tell you the time, and then for the sound of them. Why have bells if you can't ring them for five minutes straight, in casual rivalry with the next few bell towers over? The Rhein. It is wide, it flows quickly, and it reflects the sky at all times of day. I slightly regret not purchasing a wickelfisch (dry bag and floatation device) for my clothes, so that I could bundle them up and float down the river with them stored securely with me. But I regret this far more for the Aarau, which was even more emerald and clear, than the Rhein… That's a description for another day. The FOOD. Oh, the food. I was afraid it would be German food, all bread and sausages and cabbage, and that I would suffer hunger but also have the upside of a spot of weight loss. No such luck. The food is fresh, and expertly prepared, and there is a vegetarian section of nearly every good restaurant. Not only can I enjoy the ethnic cuisines I can enjoy at home (Japanese, Turkish, Spanish, Thai, Italian), but I can enjoy fabulous SWISS food. Fresh breads, fresh cheeses, desserts with fresh fruit, grilled summer vegetables, light pastas, amazing local wines… And yes, locally made chocolate. In exotic flavors.